Welcome to Home Improvement Woodworking! We have a passion for home improvements and a strong believe in quality. We believe a home should be warm, welcoming and something you can be proud of. Our love of all things home improvement began when we purchased our first home in 1999. We bought a small two bedroom war-time bungalow that had so much character and potential, we fell in love immediately. Our first major project was a kitchen renovation which involved completely gutting the kitchen and starting from scratch. When we were expecting our first child we knew we would need more space. We had a basement that was old, concrete and basically being used as a storage area with a room at the back for our workshop. 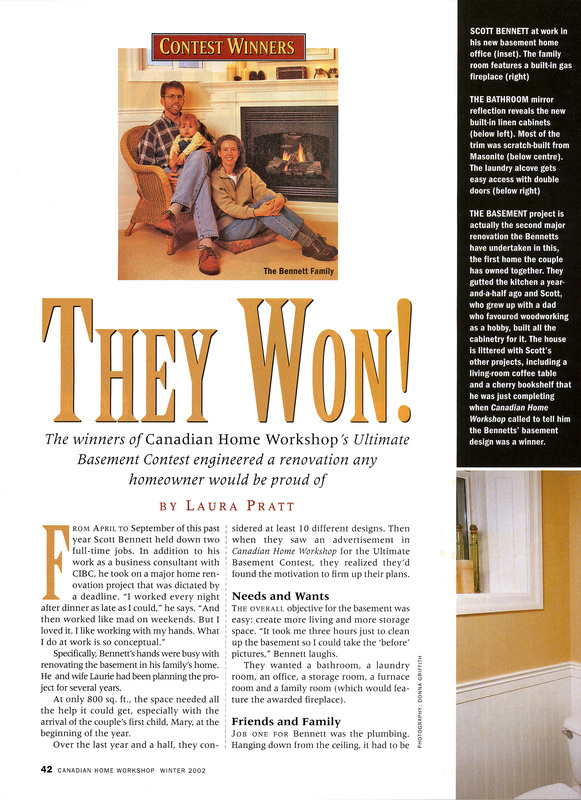 We knew the space had potential and when we saw an ad in a magazine for a basement renovation contest, we figured we had nothing to lose. We worked on our submission, entered the contest and ……WE WON! The end result was an amazing finished space that had an office, laundry room, bathroom and a warm cozy living room area. When we outgrew our first home, we bought a house that was not even a year old, a new build and while we loved the layout, it had absolutely no character, except for the victorian style detail on the exterior. It had a nice front porch and beautiful gothic style windows, but the interior felt lifeless. We immediately got to work doing small projects that would add the character and warmth that we love to our new home. Over the years we have completely renovated the entire main floor by doing everything from installing crown moulding, door trim, wainscotting and hardwood floors to updating the kitchen, building a new fireplace mantel and a complete stair renovation. 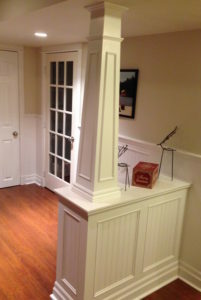 We have also finished the basement and updated a powder room that had absolutely no character. Home Improvement projects not only add value to your home, but are also a great way to add character, detail and warmth to any space.